Objective: To determine whether tight control of blood pressure prevents macrovascular and microvascular complications in patients with type 2 diabetes. Design: Randomised controlled trial comparing tight control of blood pressure aiming at a blood pressure of <150/85 mm Hg (with the use of an angiotensin converting enzyme inhibitor captopril or a β blocker atenolol as main treatment) with less tight control aiming at a blood pressure of <180/105 mm Hg. Setting: 20 hospital based clinics in England, Scotland, and Northern Ireland. Subjects: 1148 hypertensive patients with type 2 diabetes (mean age 56, mean blood pressure at entry 160/94 mm Hg); 758 patients were allocated to tight control of blood pressure and 390 patients to less tight control with a median follow up of 8.4 years. Main outcome measures: Predefined clinical end points, fatal and non-fatal, related to diabetes, deaths related to diabetes, and all cause mortality. Surrogate measures of microvascular disease included urinary albumin excretion and retinal photography. Results: Mean blood pressure during follow up was significantly reduced in the group assigned tight blood pressure control (144/82 mm Hg) compared with the group assigned to less tight control (154/87 mm Hg) (P<0.0001). Reductions in risk in the group assigned to tight control compared with that assigned to less tight control were 24% in diabetes related end points (95% confidence interval 8% to 38%) (P=0.0046), 32% in deaths related to diabetes (6% to 51%) (P=0.019), 44% in strokes (11% to 65%) (P=0.013), and 37% in microvascular end points (11% to 56%) (P=0.0092), predominantly owing to a reduced risk of retinal photocoagulation. There was a non-significant reduction in all cause mortality. After nine years of follow up the group assigned to tight blood pressure control also had a 34% reduction in risk in the proportion of patients with deterioration of retinopathy by two steps (99% confidence interval 11% to 50%) (P=0.0004) and a 47% reduced risk (7% to 70%) (P=0.004) of deterioration in visual acuity by three lines of the early treatment of diabetic retinopathy study (ETDRS) chart. After nine years of follow up 29% of patients in the group assigned to tight control required three or more treatments to lower blood pressure to achieve target blood pressures. Conclusion: Tight blood pressure control in patients with hypertension and type 2 diabetes achieves a clinically important reduction in the risk of deaths related to diabetes, complications related to diabetes, progression of diabetic retinopathy, and deterioration in visual acuity. Members of the study group are given at the end of the paper. This paper was prepared for publication by Robert Turner, Rury Holman, Irene Stratton, Carole Cull, Valeria Frighi, Susan Manley, David Matthews, Andrew Neil, Heather McElroy, Eva Kohner, Charles Fox, David Hadden, and David Wright. In the general population treatment to lower blood pressure reduces the incidence of stroke and myocardial infarction, 14 15 particularly in elderly people. 16 17 In patients with type 1 diabetes who have microalbuminuria or overt nephropathy strict control of blood pressure reduces urinary albumin excretion and deterioration in renal function. 18 19 Lowering blood pressure also decreases albuminuria in type 2 diabetes,20 but whether it also reduces the risk of end stage renal disease or of cardiac disease is not known. Of the 4297 patients recruited to the 20 centres participating in the hypertension in diabetes study, 243 had either died or were lost to follow up before the start of the hypertension study in 1987 (fig 1). Of the remaining 4054 patients, 1544 (38%) had hypertension, defined in 727 patients as a systolic blood pressure ≥160 mm Hg and/or a diastolic blood pressure ≥90 mm Hg or in 421 patients receiving antihypertensive treatment as a systolic pressure of ≥150 mm Hg and/or a diastolic pressure ≥85 mm Hg (fig 1). Patients were enrolled on the basis of the mean of three blood pressure measurements taken at consecutive clinic visits. The exclusion criteria were a clinical requirement for strict blood pressure control (previous stroke, accelerated hypertension, cardiac failure, or renal failure) or β blockade (myocardial infarction in the previous year or current angina); severe vascular disease (more than one major vascular episode); a severe concurrent illness or contraindications to β blockers (asthma, intermittent claudication, foot ulcers, or amputations); pregnancy; or unwillingness to join the study. 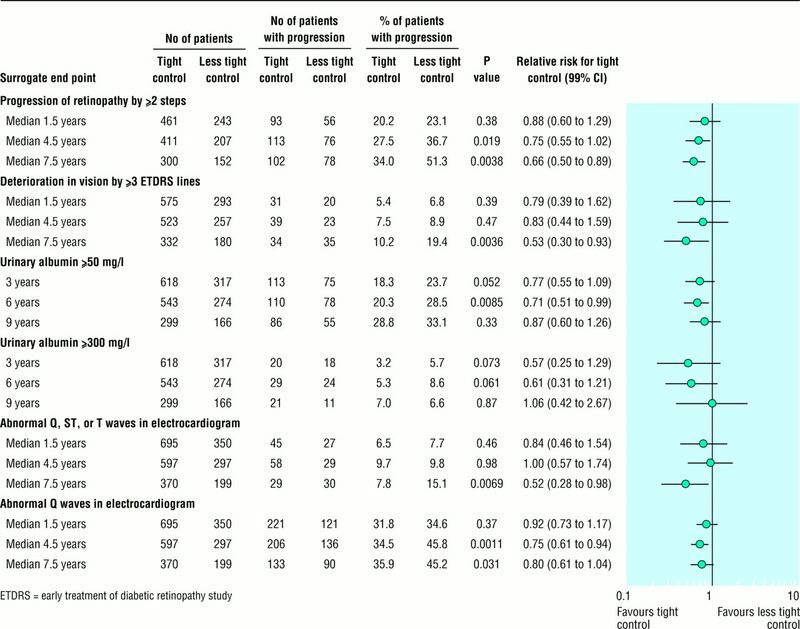 Of the 1544 hypertensive patients, 252 were excluded and 144 patients did not enter the study. A total of 1148 patients (637 men (55%)) with a mean age of 56.4 (SD 8.1) years entered the hypertension in diabetes study between 1987 and 1991.21 Table 1 shows their characteristics at randomisation to blood pressure control policy. Randomisation stratified for those with or without previous treatment for hypertension was performed by the coordinating centre. In all 758 patients were allocated tight control of blood pressure, aiming for a blood pressure <150/85 mm Hg (400 patients were given an angiotensin converting enzyme inhibitor (captopril) and 358 a β blocker (atenolol) as the main treatment); 390 patients were allocated a less tight control of blood pressure, aiming for a blood pressure <180/105 mm Hg but avoiding treatment with angiotensin converting enzyme inhibitors or β blockers (fig 1). Sealed opaque envelopes were used and checked as described for the UK prospective diabetes study.23 The original blood pressure target of 200/105 mm Hg in the group assigned to less tight control was reduced in 1992 by the steering committee of the hypertension in diabetes study after publication of the results of studies in elderly, non-diabetic subjects during 1991-2. 16 25 26 Randomisation produced balanced numbers of patients allocated to the various glucose and blood pressure treatment combinations for the UK prospective diabetes study and hypertension in diabetes study. Captopril was usually started at a dose of 25 mg twice daily, increasing to 50 mg twice daily, and atenolol at a daily dose of 50 mg, increasing to 100 mg if required. Other agents were added if the control criteria were not met in the group assigned to tight control despite maximum allocated treatment or in the group assigned to less tight control without drug treatment. The suggested sequence was frusemide 20 mg daily (maximum 40 mg twice daily), slow release nifedipine 10 mg (maximum 40 mg) twice daily, methyldopa 250 mg (maximum 500 mg) twice daily, and prazosin 1 mg (maximum 5 mg) thrice daily. Patients visited study clinics every 3-4 months. At each visit plasma glucose concentration, blood pressure, and body weight were measured, and treatments to control blood pressure and blood glucose concentration were noted and adjusted if target values were not met. If treatments and target blood pressures were not in accord with the protocol, the coordinating centre sent letters about affected patients to the clinical centres requesting appropriate action. A central record of all apparent protocol deviations was maintained. Symptoms including any drug side effects and clinical events were noted. Physicians recorded hypoglycaemic episodes as minor if the patient was able to treat the symptoms unaided and as major if third party or medical intervention was necessary. Blood pressure (diastolic phase 5) while the patient was sitting and had rested for at least five minutes was measured by a trained nurse with a Copal UA-251 or a Takeda UA-751 electronic auscultatory blood pressure reading machine (Andrew Stephens, Brighouse, West Yorkshire) or with a Hawksley random zero sphygmomanometer (Hawksley, Lancing, Sussex) in patients with atrial fibrillation. The first reading was discarded and the mean of the next three consecutive readings with a coefficient of variation below 15% was used in the study, with additional readings if required. Monthly quality assurance measurements have shown the mean difference between Takeda and Hawksley machines to be 1 (4) mm Hg or less. At entry to the UK prospective diabetes study and subsequently every three years all patients had a clinical examination which included retinal colour photography, ophthalmoscopy, measurement of visual acuity, assessment of peripheral and autonomic neuropathy, chest radiography, electrocardiography, and measurement of brachial and posterior tibial blood pressure using Doppler techniques. Annual direct ophthalmoscopy was also carried out. Every year a fasting blood sample was taken to measure glycated haemoglobin (haemoglobin A1c), plasma creatinine concentration, and concentrations of urea, immunoreactive insulin, and insulin antibodies; random urine samples were taken for measurement of albumin concentration. Visual acuity was measured with Snellen charts until 1989, after which ETDRS (early treatment of diabetic retinopathy study) charts22 were used to assess best corrected vision, with current refraction or through a pinhole. Retinal colour photographs of four standard 30° fields per eye (nasal, disc, macula, and temporal to macular fields) were taken plus stereophotographs of the macula. Repeat photography was arranged if the quality of the photograph was unsatisfactory. Retinal photographs were assessed at a central grading centre by two independent assessors for the presence or absence of diabetic retinopathy. Any fields with retinopathy were graded by two further senior independent assessors using a modified ETDRS final scale.22 Neuropathy was assessed clinically by knee and ankle reflexes, and by biothesiometer (Biomedical Instruments, Newbury, Ohio) readings taken from the lateral malleoli and the end of the big toe.22 A 12 lead electrocardiogram was recorded and given a Minnesota code,22 and a chest x ray film was taken for measurement of cardiac diameter. Biochemical methods have been reported previously. 23 27 Urinary albumin concentration was measured by an immunoturbidimetric method with a normal reference range of 1.4 mg/l to 36.5 mg/l.27 Microalbuminuria has been defined as a urinary albumin concentration of ≥50 mg/l28 and clinical grade proteinuria as a urinary albumin concentration of ≥300 mg/l. Twenty one clinical end points were predefined in the study protocol.22 All available clinical information was gathered for possible end points—for example, copies of admission notes, operation records, death certificates, and necropsy reports. Copies of these, without reference to the patient's allocated or actual treatment, were formally presented to two independent physicians who allocated an appropriate code from the ninth revision of the international classification of diseases (ICD-9) if the criteria for any particular clinical end point had been met. Any disagreement between the two assessors was discussed and the evidence reviewed. If agreement was not possible the information was submitted to a panel of two further independent assessors for final arbitration. The closing date for the study was 30 September 1997. End points were aggregated for the main analyses. The three predefined primary outcome analyses were the time to the occurrence of (a) a first clinical end point related to diabetes (sudden death, death from hyperglycaemia or hypoglycaemia, fatal or non-fatal myocardial infarction, angina, heart failure, stroke, renal failure, amputation (of at least one digit), vitreous haemorrhage, retinal photocoagulation, blindness in one eye or cataract extraction); (b) death related to diabetes (death due to myocardial infarction, sudden death, stroke, peripheral vascular disease, renal disease, hyperglycaemia or hypoglycaemia); (c) death from all causes. Secondary outcome analyses of four additional aggregates of clinical end points were used to assess the effect of treatments on different types of vascular disease. These were myocardial infarction (fatal or non-fatal myocardial infarction or sudden death), stroke (fatal or non-fatal stroke), amputation or death from peripheral vascular disease, and microvascular complications (retinopathy requiring photocoagulation, vitreous haemorrhage, and fatal or non-fatal renal failure). Since a patient could in sequence have different end points, he or she could be included in more than one end point category. Analysis was on an intention to treat basis, comparing patients allocated to tight and less tight blood pressure control. Patients allocated to tight control with angiotensin converting enzyme inhibitors or β blockers were pooled in this paper for analysis. They are compared in the accompanying paper.29 Life table analyses were performed with log rank tests, and hazard ratios were obtained from Cox's proportional hazards models and used to estimate relative risks. Survival function estimates were calculated using the product limit (Kaplan-Meier) method. 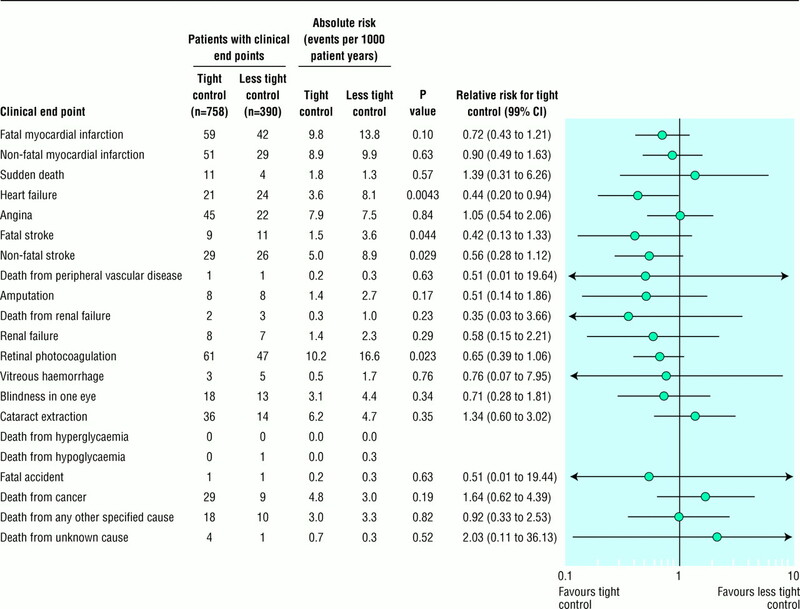 In the text relative risks are quoted as risk reductions and significance tests were two sided. For aggregate end points 95% confidence intervals are quoted, whereas for single end points 99% confidence intervals are quoted to allow for potential type 1 errors. Similarly, 99% confidence intervals were used to assess surrogate end points that were measured at triennial visits. Mean (SD), geometric mean (1 SD interval), or median (interquartile range) values are quoted for the biometric and biochemical variables, with values from Wilcoxon, t, or χ2 tests for comparisons. Risk reductions for surrogate end points were derived from frequency tables. The overall values for blood pressure during a period were assessed for each patient as the mean during that period and for each allocation as the mean of patients with data in the allocation. Control of blood pressure was assessed in patients allocated to the two groups who had data at nine years of follow up. Hypoglycaemia was determined from the number of patients allocated to a treatment and continuing with it who had one or more minor or major hypoglycaemic episodes each year. Urinary albumin concentration was measured in mg/l. Change in diabetic retinopathy was defined as a change of two steps (one step in both eyes or two or more steps in one eye) with a scale from the worse eye to the better eye that included retinal photocoagulation or vitreous haemorrhage as the most serious grade. Visual loss was defined as the best vision in either eye, deteriorating by three lines on an ETDRS chart. Both the UK prospective diabetes study and hypertension in diabetes study received ethical approval from the appropriate committee in each centre and conformed with the guidelines of the Declarations of Helsinki (1975 and 1983). All patients gave informed consent. The data monitoring and ethics committee examined the end points every six months to consider halting or modifying the study according to predetermined guidelines. These included a difference of three or more standard deviations by log rank test in the rate of deaths related to diabetes or deaths related to diabetes and major illness between the group assigned to tight control and that assigned to less tight control or between the group given captopril and that given atenolol.22 One of the stopping criteria was attained immediately before the scheduled end of the study. The median follow up to death, the last known date at which vital status was known, or to the end of the trial was 8.4 years. The vital status was known at the end of the trial in all patients except 14 (1%) who had emigrated and a further 33 patients (3%) who could not be contacted in the last year of the study for assessment of clinical end points. The mean (SD) blood pressure in the two groups was similar at randomisation (table 1). Mean blood pressure in patients over nine years of follow up was 144 (14)/82 (7) mm Hg in the 297 patients under tight control and 154 (16)/87 (7) mm Hg in the 156 assigned to less tight control (P<0.0001 in both cases) (fig 2). The mean differences in systolic and diastolic pressures were 10 (95% confidence interval 9 to 12) mm Hg and 5 (4 to 6) mm Hg respectively. Cross sectional blood pressure in patients with data at each year were similar to the data in patients with nine years of follow up. At nine years the proportion of patients with both a systolic blood pressure of <150 mm Hg and a diastolic blood pressure of <85 mm Hg was 56% in the group assigned to tight control and 37% in the group assigned to less tight control. The proportion of patients who had a mean blood pressure of <180/105 mm Hg was 96% and 91% respectively. In the group assigned to tight control of blood pressure patients took their allocated treatment for 77% of the total person years and did not take antihypertensive treatments for 6% of the total person years. In the other group patients did not take any antihypertensive treatments for 43% of the total person years; they took an angiotensin converting enzyme inhibitor for 11% of the total person years and a β blocker for 9%. 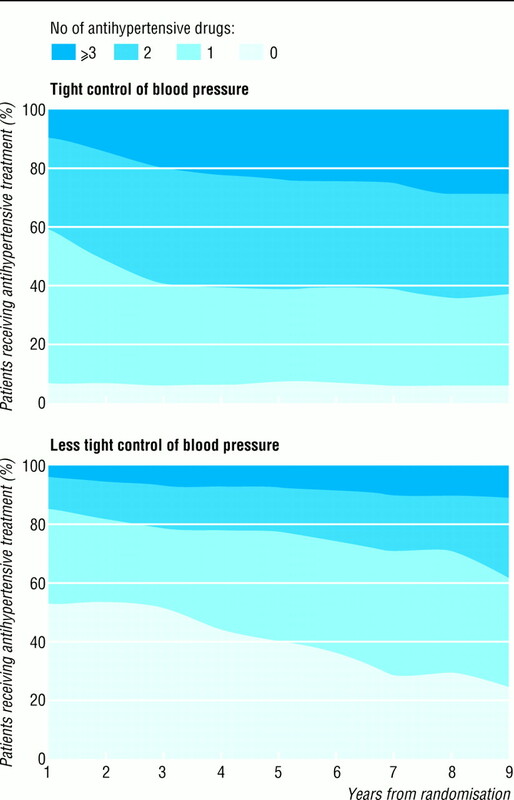 Figure 3 shows the increasing number of antihypertensive agents required to maintain blood pressure lower than target levels. At nine years 29% of those assigned to tight blood pressure control required three or more agents in comparison with 11% of patients in the other group. The proportion of patients taking nifedipine was 32% in the group assigned to less tight blood pressure control and 31% and 40% in the group assigned to tight blood pressure control taking captopril and atenolol respectively. Haemoglobin A1c in the groups assigned to tight and less tight blood pressure control over 1-4 years was 7.2% and 7.2% respectively and over 5-8 years 8.3% and 8.2% respectively. 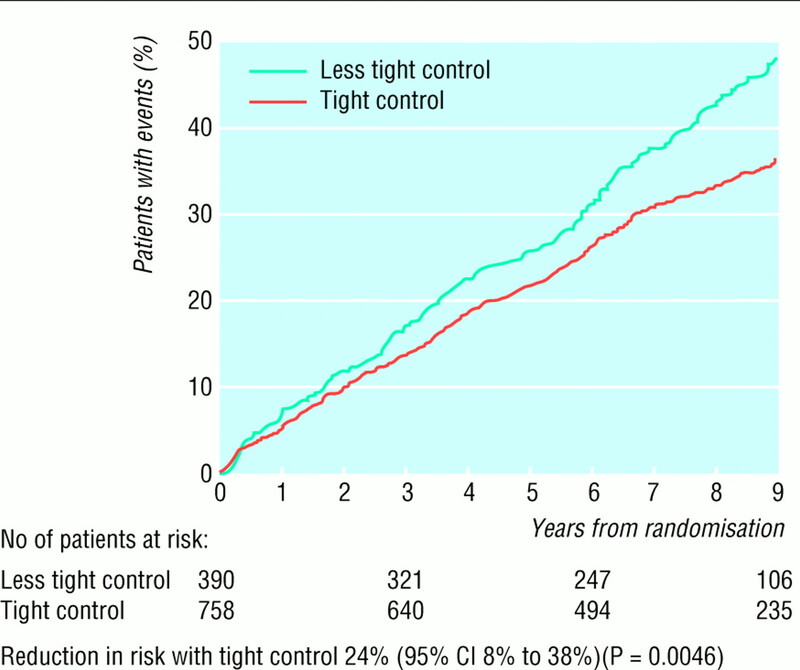 Patients allocated to tight compared with less tight control of blood pressure had a 24% reduction in risk of developing any end point related to diabetes, (P=0.0046) (figs 4 and 5). Patients in the group assigned to tight blood pressure control compared with those in the other group had a 32% reduction in risk of mortality from diseases substantially increased by diabetes (P=0.019), two thirds of which were cardiovascular diseases. The reduction in all cause mortality was not significant (fig 4). The trend to protection against microvascular disease and death related to diabetes became evident within the first three years of allocation to tight control (figs 4–7). 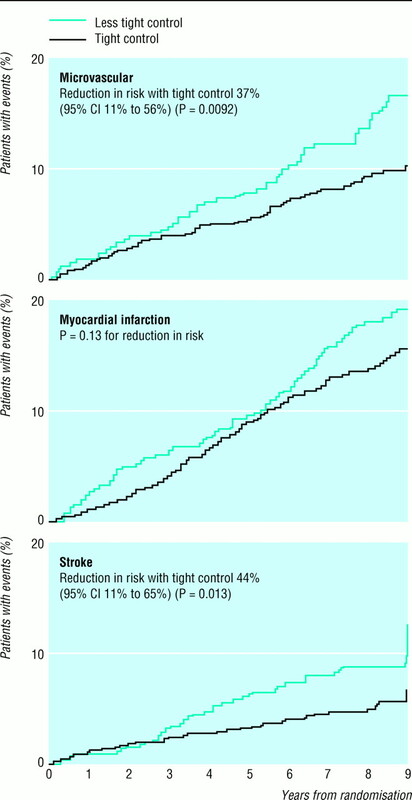 The group assigned to tight blood pressure control had a non-significant reduction in risk of 21% in the aggregate end point for myocardial infarction (table 2 and fig 7). This group also had a 44% reduction in risk of stroke, fatal and non-fatal, compared with the group assigned to less tight blood pressure control (P=0.013). Amputations were not significantly reduced, with a trend to reductions in risk of 49%. One patient in each group died of peripheral vascular disease. When all macrovascular diseases were combined, including myocardial infarction, sudden death, stroke, and peripheral vascular disease, the group assigned to tight blood pressure control had a 34% reduction in risk compared with the group assigned to less tight control (P=0.019). The group assigned to tight blood pressure control had a 37% reduction in risk of microvascular disease compared with the less tight group (P=0.0092) (figs 4 and 7). The number of patients who needed to be treated over 10 years to prevent one patient developing any complication was 6.1 (95% confidence interval 2.6 to 9.5) and to prevent death from a cause related to diabetes 15.0 (12.1 to 17.9). 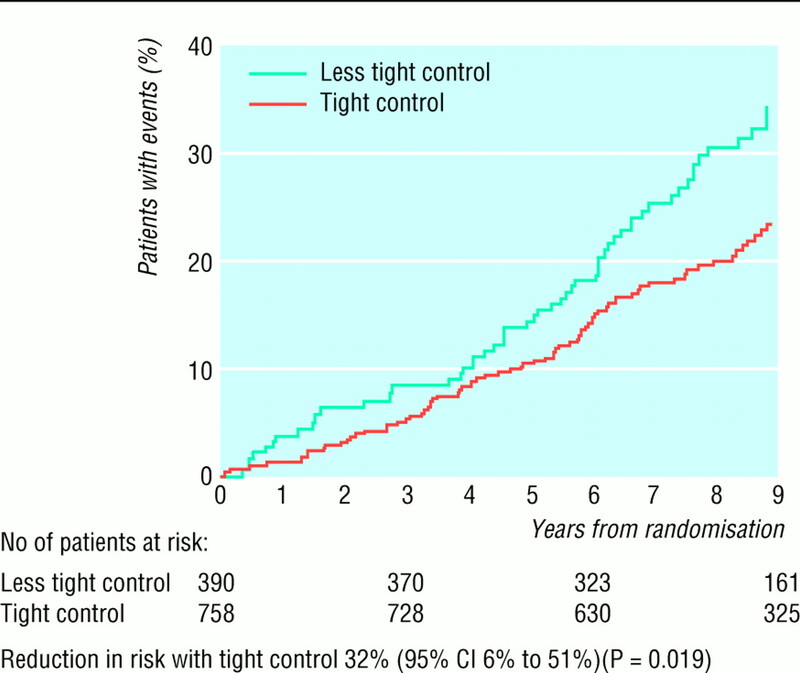 There was a 56% reduction in risk of heart failure (P=0.0043) (fig 8) in the tight control group compared with the less tight control group. There was a 35% reduction in risk of retinal photocoagulation (P=0.023) (fig 8). The trend for reduced risk of fatal and non-fatal renal failure was non-significant (fig 8). There was no significant difference in the incidence of death from accidents, cancer, other specified causes or unknown causes. Retinopathy and visual acuity—From median 4.5 years of follow up a smaller proportion of patients in the group assigned to tight blood pressure control showed deterioration in retinopathy from baseline by two or more steps (fig 9), with a 34% reduction in risk by median 7.5 years (P=0.004). This was partly because fewer patients required retinal photocoagulation, but the risk was still significantly reduced when retinal photocoagulation was excluded (data not shown). 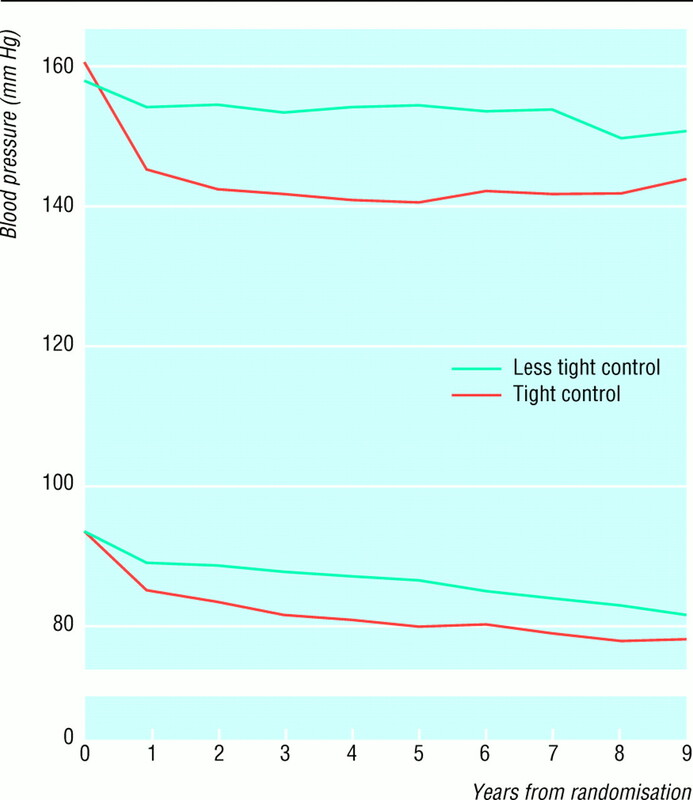 At nine years of follow up the group assigned to tight blood pressure control had a 47% reduction in risk of a decrease in vision by three or more lines in both eyes measured with an ETDRS chart (P=0.004) (fig 9). There was no significant difference in the proportion of patients with impaired vision preventing driving (visual acuity < 6/12 Snellen or ETDRS chart>0.3), although the trend was for a 28% reduction in risk in the group assigned to tight control (32/371, 8.6%) compared with the group assigned to less tight control (24/201,11.9%) (P=0.20). Microalbuminuria and proteinuria— By six years a smaller proportion of patients in the group under tight blood pressure control had a urinary albumin concentration of ≥50 mg/l, a 29% reduction in risk (P=0.009), with a non-significant 39% reduction in risk for proteinuria ≥300 mg/l (P=0.061) (fig 9). The reduction in risk for both a urinary albumin concentration of ≥50 mg/l and proteinuria at nine years of follow up was not significant. There was no significant difference in plasma creatinine concentration or in the proportion of patients who had a twofold increase in plasma creatinine concentration between the two groups. Neuropathy—The surrogate indices of neuropathy and autonomic neuropathy were not significantly different between the two groups. ECG abnormality—By median 7.5 years the tight control group had a lower proportion of Q wave ECG abnormalities than the less tight control group, 29/370 and 30/199 (7.8% and 15.1%, P=0.007) respectively, a 48% risk reduction. ST and T wave abnormalities were also reduced in the tight control group (fig 9). There was no difference between the allocations for other surrogate indices of macrovascular disease. There was no significant difference between the groups in the proportion of patients who developed surrogate indices for macrovascular disease. Hypoglycaemia— There was no significant difference in the cumulative incidence of hypoglycaemia in the groups assigned to tight and less tight blood pressure control, with 6.1% and 4.4% respectively having a major hypoglycaemic attack. The cause of death in one patient in the group assigned to less tight control of blood pressure was attibuted to hypoglycaemia. Weight gain— Mean weight gain was similar in the two groups (1.3 kg in the group assigned to less tight control and 2.0 kg in the tight control; P=0.13). Retinopathy —The was a 34% reduction in the rate of progression of retinopathy by two or more steps using the modified ETDRS final scale. The 47% reduction in the deterioration of visual acuity by three lines using the ETDRS chart (equivalent to a change from 6/6 to 6/12 or 6/9 to 6/18 on the Snellen chart) suggests that tight blood pressure control also prevented the development of diabetic maculopathy, which is the main cause of visual impairment in type 2 diabetes.33 In the UK prospective diabetes study diabetic maculopathy occurred in 78% of patients requiring retinal photocoagulation. As diabetic maculopathy responds less well to laser retinal photocoagulation than proliferative retinopathy, 34 35 reducing the risk of maculopathy by tight blood pressure control might provide a major clinical benefit in reducing the risk of blindness. To our knowledge this is the first report in patients with type 2 diabetes to show that tight blood pressure control reduces the risk of clinical complications from diabetic eye disease. In this study the mean blood pressure in the group assigned to tight blood pressure control was 144/82 mm Hg which is lower than the blood pressures often achieved in hypertensive subjects with or without diabetes. Advisory groups have recommended that the goals for blood pressure in diabetic patients should be <140/90 mm Hg,38–40 <140/85 mm Hg,41 or <130/85 mm Hg. 42 43 These recommendations are based on studies in the general population14 and in patients with type 1 diabetes with microalbuminuria or established nephropathy. 18 19 Guidelines were formulated on the assumption that data relating to hypertensive non-diabetic subjects and relatively young patients with type 1 diabetes also applied to those with type 2 diabetes. The prevention of both macrovascular and microvascular disease observed in this study provides evidence for the necessity of tight blood pressure control in type 2 diabetes. The recommendations for the less strict “fair” or “acceptable” blood pressure control targets by some of the advisory groups of 160/95 mm Hg,38 <160/90 mm Hg, 40 41 or <150/90 mm Hg39 need to be reviewed in the light of the results of our study. Hypertension is common in patients with type 2 diabetes, with a prevalence of 40-60% over the age range of 45 to 75. This study, embedded within the UK prospective diabetes study, shows that treatment with an angiotensin converting enzyme inhibitor or β blocker aiming for a blood pressure of <150/85 mm Hg substantially reduces the risk of death and complications due to diabetes. The management of blood pressure should have a high priority in the treatment of type 2 diabetes. We appreciate the cooperation of the patients and many NHS and non-NHS staff at the centres. We thank Philip Bassett for editorial assistance, and Caroline Wood, Kathy Waring, and Lorraine Mallia for typing the manuscripts. Funding: The UK prospective diabetes study and the hypertension in diabetes study was funded by grants from the Medical Research Council, British Diabetic Association, Department of Health, the United States National Eye Institute and the United States National Institute of Diabetes, Digestive and Kidney Disease in the National Institutes of Health, the British Heart Foundation, the Charles Wolfson Charitable Trust, the Clothworkers' Foundation, the Health Promotion Research Trust, the Alan and Babette Sainsbury Trust, the Oxford University Medical Research Fund Committee, and pharmaceutical companies, including Novo-Nordisk, Bayer, Bristol-Myers Squibb, Hoechst, Lilly, Lipha, and Farmitalia Carlo Erba. GlaxoWellcome, SmithKline Beecham, Pfizer, Zeneca, Pharmacia and Upjohn, and Roche provided grants for health economics and epidemiological studies. Boehringer Mannheim, Becton Dickinson, Owen Mumford, Securicor, Kodak, and Cortecs Diagnostics gave additional help. In: Prescott-Clarke P, Primatesta P, eds. Healths urvey for England 1995.London:HMSO,1997. In: Harris MI, Cowie CC, Stern MP, Boyko EJ, Reiber GE, Bennett PH, eds. Diabetes in America. 2nd ed. Washington, DC:National Institutes of Health, National Institute of Diabetes and Digestive and Kidney Diseases,1995. .UKp rospective diabetes study 33: intensive blood glucose control withs ulphonylureas or insulin compared with conventional treatment and risk ofc omplications in patients with type 2 diabetesLancet1998; 352:837–53. .Blood pressure and diabetes:e veryone's concern.London:British Diabetic Association,1994.